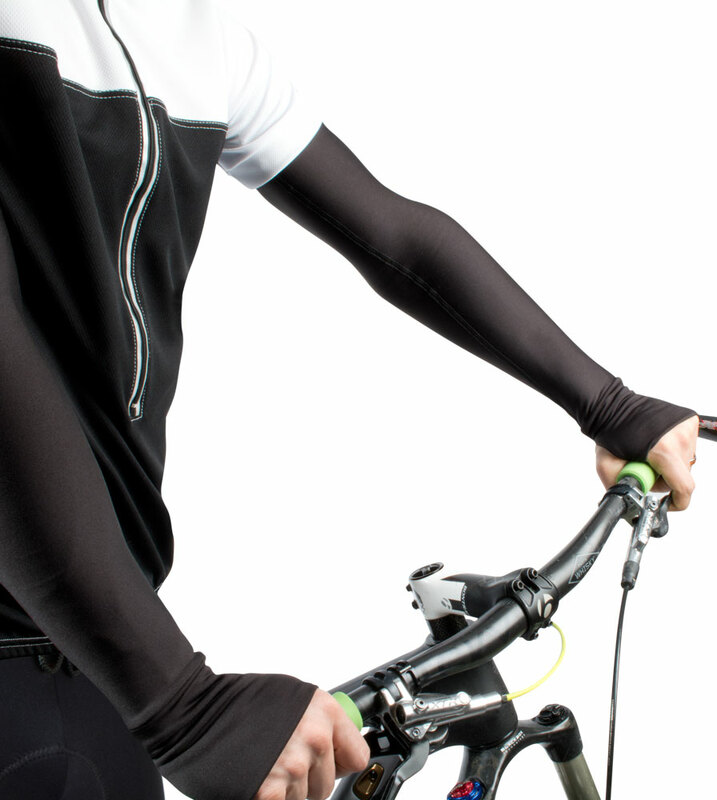 Fun and Functional Removable Sleeve Arm Warmers for Cyclists. Must Have All Season Gear!! The Endurance Arm Warmers with Thumb Hole Removable Sleeves offer the perfect all season comfort for chilly days or cool morning and evening rides. Just slip on the arm warmers and loop them over your thumb to stay put and keep your bady heat close to your skin. A smooth silicone gripper helps the removable sleeve arm warmer stay in place around your bicep and the cuffs are designed to hug your hands without interfering in grip and dexterity. With flat long seams these arm warmers fit snug and smooth like a second skin and fold up tiny to slip into your jersey pockets. The removable sleeves are a convenient option so you can be prepared to ride on all year long! Be Prepared to R ide All Year Long! Get Your Awesome Arm Warmers TODAY and Get Out and Ride! I love these. I am a hot natured person, and these are just right for chilly mornings. The grippers kept them up and they were not too tight or uncomfortable. I am impressed. This is a great product. Very well constructed. I ordered a large I'm 6'3 175lbs and thin. The product is great, however I should have ignored the sizing and ordered a medium the large fall down as I use them. It's my bad I'd already washed them before I figured this out. This is not a knock on the product. Just a suggestion to go a little smaller than you'd think on the ordering. i recently purchased a 2nd pair, as i am recovering from 3rd degree burns. they cover up the burn well, and stay on my arm protecting me from the sun. Its been very difficult to find items like this that actually cover my hand where a large part of the burn is. I was sent a size too large, and after a brief and polite conversation i was sent the correct size, receiving it in the mail just 2 days later. It was one of the best experiences buying something online that i've had in a long long time. I got the Lava arm warmers which have gorgeous colors, fit perfectly and I would definitely buy another pair. I like the quality of fabric and also that there are rubber grips at the tops of the warmers and I love the extension that allows for more comfort and warmth with the thumb holes. I love my arm warmers. I also brought the Jersey to match. I don't ride bicycles, I ride a motorcycle, I get all type of compliments on how colorful and nice I look. This is my first time leaving a comment on any product I brought, but the funny part is I read reviews, so I'll know a little about the product. Thanks Areo tech for creating a good and colorful product. I have large upper arms and have difficulty finding arms warmers to fit. I ordered an extra large and they were too big and baggy for me. I would have exchange them for a smaller size , but I didn't realize they had a thumb hole which will interfere with my cycling gloves. So I opted to send them back for refund. I have cycling pants that matched the warmers and I have a fun event coming up that I was planning on using them for. My riding gloves and comfort is important so I need to think of something else . Thank you for making the return process so easy . I ordered Large because I have long arms but the 13" bicep circumference is too large & would never stay up on my arm. Length is plenty long enough. Returning to exchange for a Medium size. The 1/2 inch I will lose in length with the medium shouldn't be a problem. Bought these for my husband thinking the length might work as he has very long arms. The length is good, but they are way to big around and do not stay up. Got the lava lamp arm warmers just for fun. Wore them in 52degrees with short sleeve jersey and no jacket.they did the job. The top of the arm is a generous fit so measure carefully. Got a large and could probably used a medium. They do get noticed! Keeping them however. Sleeves are amazing and a head turner for sure. So I bought these in white, hoping to use them as sun protection sleeves. In fact, the fabric is just a little bit too thick for that -- you'd be hot if you wore these on a hot summer day. However, they're not as warm as the typical fleece arm warmer. I thought about returning them, but then I gave them a try on a cooler summer evening ride, and they were perfect -- warm, but not too warm. They breathed amazingly well, too: It was a tough workout, so my jersey was soaked when I was done, but the warmers remained dry. I've used them running, too, with the same good result. The fit is OK -- a little wide at the top for me, but the length is great. (I have thinner, but longer, arms.) Could live without the silicone gripper (which isn't gripping on me anyway). Was thrilled to get these in the mail. So colorful ! I purchased the medium which fit me perfectly. Love the fabric very comfortable. Love when fashion meets function. The arm warmers are very pretty, people stop me all the time to inquire about them. Do you want me to start rep ing them in Southern Cal? I wear them when I'm not cycling, just to keep arms warm or preventing too much sun exposure. The colors match just about everything I wear, especially at Zumba and Taebo workout. People ask about them for many purposes. I ordered 'lava lamp' and I love the colors! I usually wear a 1X and I wasn't sure about the XL but the fit is great! I don't like a lot on my arms and they are not too thick. This is perfect for cooler mornings that go into warmer mid days.